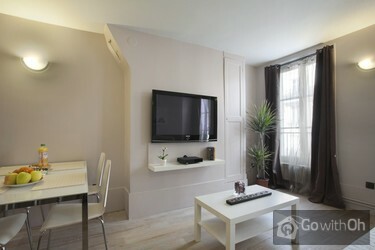 This lovely apartment has been tastefully decorated and is well located in the modern Marais district. 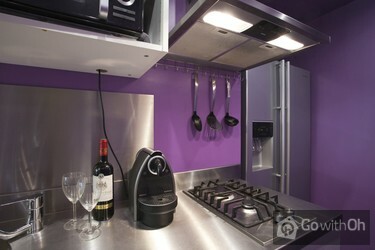 The apartment is designed to comfortably accommodate up to 4 people in designer surroundings. 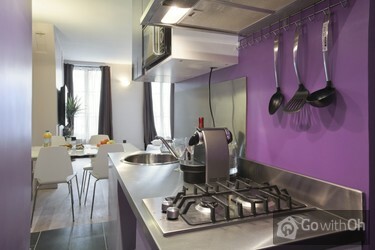 The property is situated on the fourth floor of a typical Parisian building (without a lift). 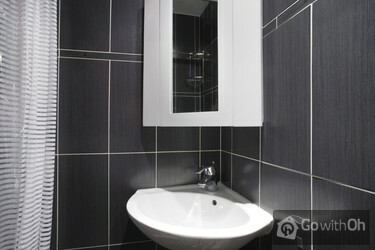 The 37m2 apartment was completely refurbished in 2012 and consists of two rooms. In the first you will find a reception area, a living room with a comfortable double sofa-bed, a dining area and a wonderful, fully-equipped open-plan kitchen. 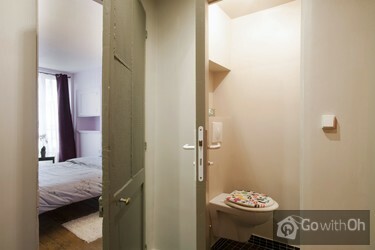 In the sleeping area there is a gorgeous bedroom with a double bed and a bathroom with a shower. You will also be able to enjoy the full range of technology at your disposal, including a flat-screen television with cable channels, a DVD player and an internet connection (Wi-Fi or by cable). Check-in between 16:00 and 21:00. Late check-in after 21:00 will incur an additional charge of 30. Check-in after 23:00 is not permitted. Check-out between 08:00 and 11:00. Early check-out before 08:00 will incur an additional charge of 30. Appartement très propre , calme,bien situé, facilité d'acces ,très bon accueil du propriétaire . El apartamento está muy bien situado y aunque es pequeño y esta en un cuarto piso, dos adultos con dos niños hemos estado muy bien. El apartamento ha cumplido nuestras espectativas. Moderno y limpio con todo lo necesario. El propietario muy amable. Buenas, la verdad es que el apartamento estaba muy bien, era pequeñito pero suficiente para nosotros cuatro. La ubicación muy buena, porque estaba muy cerca del metro. El propietario se adaptó a nuestras necesidades y fue encantador.Todo perfecto. Gracias. Wir waren begeistert, gerne wieder! Belle appartement, petit mais bien situe, très proche du metro..pas d'ascensor cependant dans un cinquième étage. Quartier très agréable a visiter, des bons petits resto, des galeries, quartier pas trop touristique et branché. Nous avons beaucoup aimée! Our stay was very enjoyable, the Marais area is perfect if you want to avoid the touristy areas and instead experience the real Parisian lifestlye! Lots of small boutiques, musuems and lovely cafes. S. (the owner) was very friendly and helpful. We did have a slight issue trying to locate the ...apartment as there was no street number on the booking reference, however this was sorted out once I called S. The apartment is small but very cosy and I must emphasise, absolutely spotless clean. Credit to S. for presenting his apartment so well. 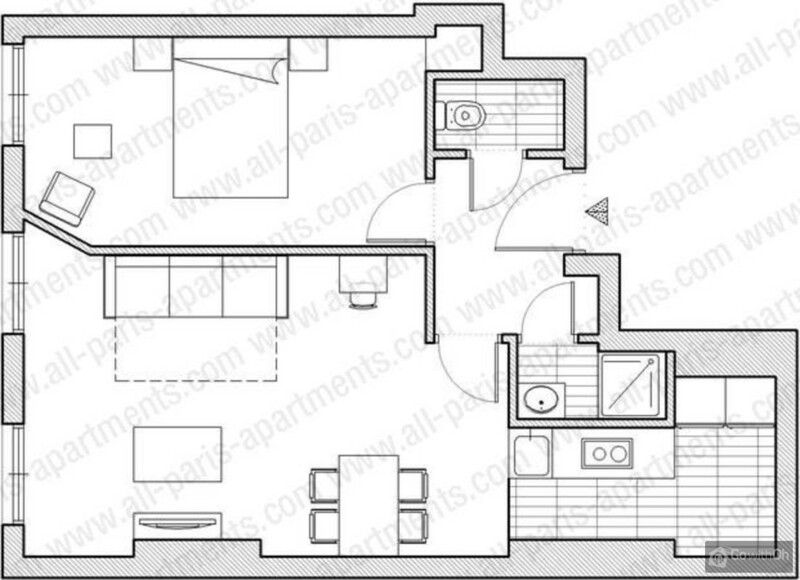 Something to mention is that the apartment is perfect for two people but perhaps more than this would be a bit crowded. 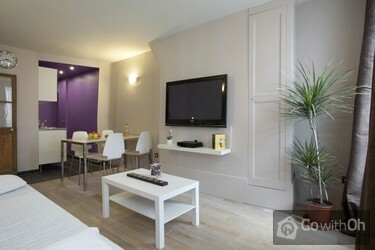 Overall I have no hesitation in recommending this apartment, it is a wonderful example of real Paris! Plus:Cute small flat in a very nice area.The owner is very friendly and helpful.Minus:The bathroom is very small. - Unterkunft war wunderbar sauber, sehr nette Kontaktperson, die Lage hervorragend. Eine sehr süße, sehr, sehr kleine Wohnung, die jedoch für uns 2 Erwachsene +2 Kinder (9+11J) absolut ausreichend war. Treppensteigen darf einen nicht abschrecken (4. Etage), Infrastruktur ist super, Kontaktperson spricht perfekt englisch und ist sehr nett. The apartment was very clean and comfortable, and Etienne, the owner very helpful and welcoming. Wir sind gut in Empfang genommen worden und die Wohnung ist wie auf der Internetseite angezeigt. Es hat stark nach Reinigungsmitteln gerochen, das war aber auch wirklich der einzige Negativpunkt! Es hat einfach alles gepasst, die Wohnung ist wie beschrieben und auch der Vermieter war sehr nett und zuvorkommend. Sehr netter und aufmerksamer Vermieter, mit hilfreichen Tipps. Die Lage ist sehr gut und die Ausstattung des Appartements ebenfalls. Die Wohnung kann ich jederzeit weiter empfehlen. Siamo stati benissimo e l'appartamento è ubicato in una posizione fantastica a due passiva Place de la Republique E nel pieno centro vivace del quartiere le Marais. Siamo stati con i figl, l'unico appunto da fare i 4 piani a piedi che dopo una giornata di visite non sono il massimo. Il ...proprietario molti disponibile e gentile. Appena arrivati nom sapevamo come suonare visto che non c'era nemmeno il campanello fuori ma solo il codice. Così abbiamo chiamato in ufficio e nonostante fosse domenica avete contattato il proprietario che è subito venuto ad aprirci. Very good location, the owner was nice and helpful, the apartment was a little small but well equipped. Ci siamo trovati benissimo, i proprietari sono molto premurosi ed affettuosi. La bellezza di questo quartiere è nota a tutti, ottimamente collegata con tutta la città. Dentro del apartamento se estaba muy cómodo (a pesar de que el baño era muy pequeño), pero la escalera necesita algo más que un lavado de cara. La imagen del edificio por fuera (fachada) y la imagen del apartamento por dentro (funcional y cómodo) contrasta con la imagen cuando subes desde el ...portal hasta el apartamento. La persona de contacto fue muy amable y con algún detalle inesperado. Nos gustó la zona en la que está el apartamento (barrio de Marais). Estar a poca distancia de una estación de metro mejora aún más la valoración. Valoración positiva de la estancia. Regresaría una próxima vez. Het appartement ligt in een mooie wijk, dicht bij het centrum van Parijs. Het appartement is netjes, schoon en ingericht zoals de foto's weergeven. De eigenaar is zeer behulpzaam en vriendelijk. Een absolute aanrader voor een bezoek aan Parijs. Ein ganz reizender, aufmerksamer Vermieter und eine tolle Lage sind das beste an dieser Unterkunft, die im Übrigen auch sehr sauber und zweckmässig eingerichtet ist. Ottima posizione, ottima accoglienza, l'appartamento è carino e non manca di nulla. Un grazie ancora a S. per la gentilezza. Fantàstic apartament a la part alta de Marais, tranquil i acollidor. Situat a una zona molt tranquil.la del barri, a dos minuts a peu de la plaça de la República i del cor del barri, ben comunicat amb el metro i bus. Tracte excel.lent amb els propietaris; petits supermercats, "boulangeries" i ...restaurants a tocar. L´escala comunitària, de fusta i compendasa, és una merevalla arquitectònica. Valorem l´estada a l´apartament com a excel.lent per famílies amb nens. Com la resta d´opinions també pensem que la dutxa és una mica petita, tot i això la valoració és molt bona. Salutacions...! Alojamiento muy bien situado. Trato muy amable. Además la limpieza es impecable. Merece la pena calidad precio. El apartamento está en un cuarto sin ascensor y la escalera es muy pequeña. Hacia bastante calor, aunque el propietario es muy amable. The host is very helpful, the location of the appartment is perfect, the house is quiet, this neighbourhood is very French and you will feel it on every corner, boulangerie, marché, etc. Everything is within the walking distance, which is a plus. Excellente situation dans un bel quartier. Propriétaire très obligeant. Propre appartement. Excellent location, good facilities, wonderful owner who was so helpful. This is a great apartment in a superb location. Clean, well equipped and a good size for two adults and one child. The owner could not have been more helpful and generous. Would highly recommend. Die Wohnung war sauber geputzt, nett eingerichtet und vor allemsehr zentral im Marais gelegen. Alleine das Marais hat uns sehrgefallen, Geschäfte und ein Markt zu Fuß gut erreichbar.Unsere Vermieter waren sehr nett und bemüht, uns unsereWünsche zu erfüllen. Alleine die Küche war nicht ganz ...üppigausgestattet, wir konnten aber immer nachfragen, da die Ver-mieter nebenan wohnen. Sehr zu empfehlen!! The owner and his wife are very nice, really helpfull and friendly people. Lovely inetrior, comfortable beds. The only thing that we missed in the appartment were... hooks for towels in the bathroom:-)))) But still we would come back gladly! Fantastic! We were two adults and two kids and we couldn't have had a better stay in Paris! The owner was extremely helpful and kind! Score: 10/10! 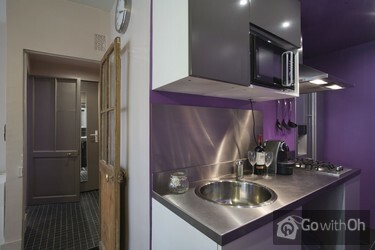 This is a great apartment to stay in while visiting Paris. It is located in the beautiful Marais District which has many shops, cafes and close Metro and bus stops, but is also a quieter residential area ideal for retreating from the bustling city. Stephane was an outstanding host who help us with ...any of your needs including booking a yearly morning Taxi to the train station (5:30 pick up). He also helped us know what metro stops to use for various sights we wanted to visit. He lives near the flat so he is easily available. The flat itself was quite spacious for Parisian standards. We are a family of four including two teenagers 16 and 17 and it had plenty of space. The furnishings are nice and very clean. I will stay here again the next time I visit Paris. We stayed for the second time at this appartment. The owner is very friendly, uncomplicate and helpfull. The location and the appartment made us feel at home. We will come back! L'appartamento è molto ben ubicato, in un quartiere molto vivace e servito, ma tranquillo, ideale anche con bambini purchè deambulanti, con possibilità in 10-15 minuti di raggiungere a piedi la M1 e tutta Parigi. I servizi sono un po' angusti (specialmente il lavabo) e nonostante le buone... dotazioni (frigo americano con ice-dispenser, cucina e stoviglie ok, microonde, letto comodo, grande tv lcd, condizionatore) e la recente ristrutturazione, ci sono alcune finiture rimaste antiche.I proprietari sono comunque gentilissimi e disponibilissimi, ci hanno consentito di lasciare anticipatamente i bagagli al ns arrivo, avvenuto in mattinata. La scala condominiale è un po' erta, sconsigliabile a chi ha passeggini...In definitiva, consigliato! Perfect location!! The shower is very small, even for a petite person. It would be good for those looking to explore Paris. The owners are very nice and helpful. Wir sind eine Familie mit zwei kleinen Kindern und waren schon oft in Paris. Wir buchen in der Regel ein Apartment für unseren Aufenthalt. Dies war das 1. mal, dass der Vermieter sich Zeiit für uns genommen hat und sich sehr nett mit uns unterhalten hat. Er hat uns viele nützliche Tipps gegeben.... Das Apartment ist sauber und hat eine gute Ausstattung. Es ist ausreichend für 4 Personen. In der Umgebung sind viele Geschäfte und kleine Supermärkte. Das Apartment ist sehr ruhig im wunderschönen Marais gelegen. Bis zur Metro ist es nicht weit. Barrio muy céntrico y con mucho ambiente de comercio, terrazas, etc. Propietario muy atento y apartamento reformado en un edificio antiguo.